Emerging from St Paul’s Cathedral, you are surrounded by cafes, restaurants and bars – and, if you have boldly climbed the hundreds of stairs up to the viewing galleries, you will definitely be ready for some sustenance. However, remember you are in London’s financial quarter, The City, which means there are some rather pricey options around. Luckily I’ve been by there recently to check out the the best mid-price places. Brasserie Blanc is one of the best of these. 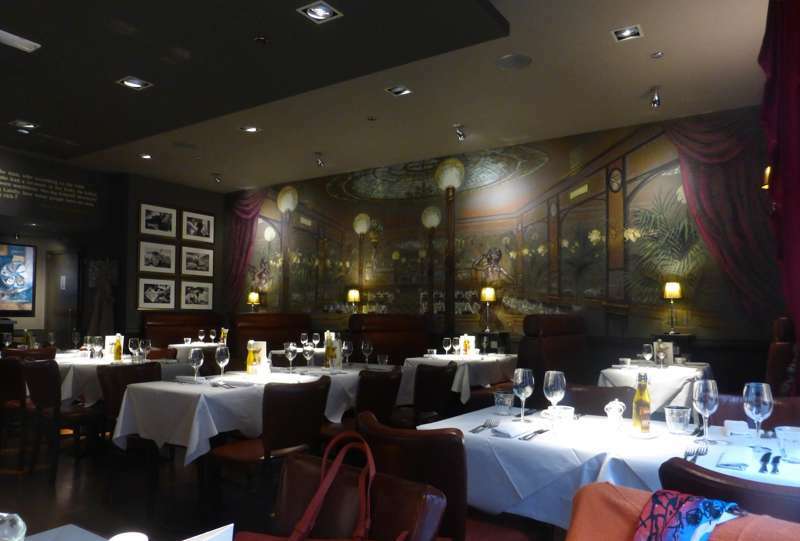 Brasserie Blanc is part of the empire of the celebrity chef Raymond Blanc, whose brasseries offer great value tasty French style set menus. We checked out the a la carte menu but found plenty of choice on the set menu so went for the 2 courses for £14 and we were easily tempted to add a glass of wine for just £2.50! For my starter I chose the cauliflower soup creamed with grana padano cheese, which was very tasty and not at all heavy despite the cream and generous amount of cheese. My friend, being a more health-conscious type, chose the beetroot salad, braised with watercress and balsamic dressing, which had a good bite to it and plenty of earthy beetroot. Moving on to the main courses – a good choice of 4 different options – I went for more cheese in the form of a French onion and gruyere tart, with a green salad. This was so moist and light with a great mix of cheese and onion and a crumbly pastry that it just slipped down, and the accompanying salad was crisp and well dressed to give it extra flavour. My friend went for the hot smoked salmon and haddock fishcake, pan-fried with creamed leeks (which required a £1 supplement). The fishcake was big enough to be served on its own, the creamed leeks still had a nice crunch in them and the creamy sauce was smooth and not overpowering. The house wine disappeared pretty quickly but was a decent-sized glass and we thought hard about dessert but really couldn’t manage any more food at lunchtime. An extra course would just add another £2.50 if you're hungry enough. The full bill for 2 came to £38 including service, which was excellent value. The staff were welcoming, the room comfortable and well decorated so, all in all, we enjoyed our visit. They also have a bar area if you just wanted to pop for coffee, drinks or even breakfast – they open at 7.30am. The only problem is that like so much in the City, they're not open at weekends. A pity – it's one of the best places to eat in the area.